We invited our fathers in to read with us and to watch our assembly. We were very lucky to be invited to Olivia's mum and dad's wedding. Thank you so much! You all looked beautiful! Look Who visited Class R! Mrs Hough kindly paid a visit to Ckass R and explained lots of things that she does at her veterinary practice. She also brought along 2 special visitors for us to hold. We would like to thank Mrs Hough for her time and effort. Having fun in the vets! I can't believe we are already into the summer term, the weeks are passing by so quickly. Our next topic is 'Animals and Growing' and we have lots of fun things planned. We will soon be busy changing the role-play area into a vets and hopefully we may be lucky enough to have a visit from a local vet. She may also bring in a couple of special visitors. Welcome to the Spring Term 2016! A huge well done to all the children in Class R.
Everyone remembered their lines and you all looked fabulous. We had a fabulous day dressing up as our favourite book characters. A special well done to Lola, Class R's winner! This term Reception Class will have two topics ... Bears and Fairy Stories. Watch and listen out for stories such as Goldilocks and the Three Bears, Rupert Bear, We're Going on a Bear Hunt. We will be designing and making our own houses for the three little pigs, writing our own teddy bear poems and re-enacting stories and singing songs and rhymes. Our Curriculum newsletter gives more information so why not take a look?! We have been writing amazing stories about the Gingerbread Man ... and we have made our own puppets to help us tell the story of the Three Little Pigs. Reception Class is a very busy place to be ... we are learning new things all the time! We have been celebrating Chinese New Year ... Kung Hey Fat Choy! We have been creating some fantastic artwork! Making Our Own Yummy Gingerbread Men! We have been using BeeBots to help us learn Computing. Our PTA bought these for us... THANK YOU! We LOVE them!!! Do you like our castle? We LOVE it! Team work in Reception Class! Stephen Waterhouse showed us how to draw. The chicks arrived and we have been watching them! A huge WELL DONE! to all Class R.
We have been having lots of fun in our sea den. Jasmin and Emilia dressing up as mermaids. A big thank you to those parents who supported 'Operation Christmas Child' by sending in cakes for the cake sale. The school council held their cake sale on the last day of term and raised a massive £105.47! 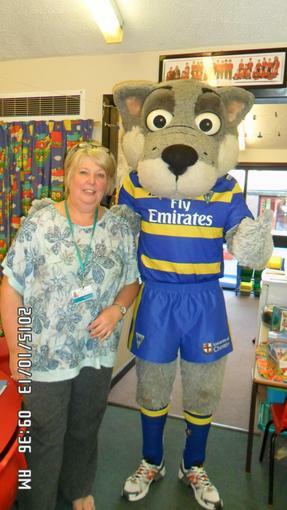 Look who visited Class R today, Wolfie! A big, warm welcome to you all! I am really looking forward to an exciting and fun packed year. I'm sure we will all have a great time. Maths Champs - Exciting games to help you learn Be a Maths Champ!